Private Rental - Excellent for Large Groups & Events! Bear Lodge is a private rental, perfect gathering place for large groups and special events who desire a unique Northwoods experience. Located in the Winchester and Manitowish Waters area, this rustic lodge is situated on 4 acres of land and South Turtle Lake of the Turtle Chain with year-round on-site fishing and hundreds of miles of the finest snowmobile trails right outside the door. 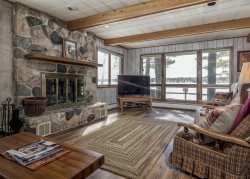 Close to Indianhead Mountain, Blackjack and Powderhorn ski hills and a five-minute drive to two cross country skiing trail systems, enjoying the Northwoods winter has never been better! The lodge is one of the Northwoods most unique rentals and includes features such as a 16 seat bar with coolers, multiple big screen TVs, multiple fireplaces, and a vintage jukebox. The huge commercial kitchen comes fully equipped with a commercial stove, pizza oven, multiple refrigerators, and dishwasher. Relax and enjoy your stay in the incredible great room or one of the cozy sitting rooms throughout the lodge. The oversized parking lot is perfect for multiple vehicles with boats or snowmobile trailers. The large dock can accommodate multiple boats as well! Don't just come to the Northwoods on vacation, at Bear Lodge you can have the adventure of a lifetime. AUGUST 2018 UPDATES: New Septic System and New Water Softener System for the entire lodge! JANUARY 2019 UPDATES: Brand New Mattresses on ALL Beds! Interested in holding an event at the Bear Lodge? Contact our office for more information! This trip was wonderful. Your team was easy to work with and answered all our questions promptly. Great people to work with. Place was great. Clean and well stocked. Your team was great to deal with. Your prompt response to the sewer problem was greatly appreciated. We all loved staying there. Great common areas for a large group. We cooked most of our meals there for many people. There are a few issues but nothing too major. This place was awesome. I feel like my previous review did not do this place justice. If you have more than 8 people, you will not find a better place to stay than the Bear Lodge. This place is huge and it is a lot of fun. We will be back. Joe and Julie were great to work with. Very easy and accommodating. The only bummer was when the sewage backed up into both of the main bathrooms and we couldn't shower or get ready for New Year's Eve. However, Joe got a plumber out there as soon as he could; so that was appreciated. South Turtle Lake is a 466 acre lake located in Vilas County. It has a maximum depth of 40 feet. Visitors have access to the lake from a public boat landing. Fish include Musky, Panfish, Largemouth Bass, Smallmouth Bass, Northern Pike and Walleye. The lake's water clarity is low. Click Here!